Gelatine is a collagen used in cooking derived from either veal, beef or pork. Gelatine sets completely below 4°C and melts at 35°C giving it a velvety mouthfeel that is difficult to replicate, although vegetarian substitutes – such as agar agar – are becoming more widely available. Gelatine comes in four grades: bronze, silver, gold and platinum. Each grade of gelatine has a different strength or ‘bloom’, with bronze the weakest and platinum the strongest. This can become quite confusing but fortunately the sheet size in which gelatine is sold is adjusted accordingly, with a stronger bloom meaning a slightly smaller sheet size, meaning that sheet for sheet all grades have the same setting properties. Bronze gelatine is the most commonly used grade in commercial kitchens whilst platinum grade is normally sold in supermarkets in packs of 15 leaves. 1 sheet of gelatine will set around 100ml liquid to a soft setting. Do not leave the gelatine to soak in the water too long as this will diminish its setting properties. When adding gelatine to a liquid make sure that it is not boiling as this will also weaken the set. Gelatine can be melted down and reset 2 or 3 times as long as it is not overheated. 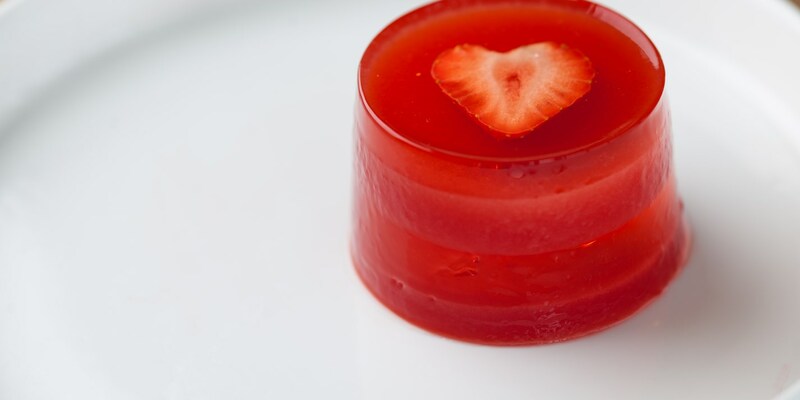 Try using gelatine to make jellies such as Martin Wishart’s Elderflower jelly with berries or Galton Blackiston’s traditional jelly and ice cream. You can make savoury jellies to, try Phil Fanning’s Panzanella with tomato jelly for a refreshing starter. Gelatine is also used to make soft set panna cotta, try Josh Eggleton’s rich Caramel panna cotta with homemade gingerbread or Alan Murchison’s White chocolate panna cotta with honeycomb ice cream.